It is said that first impressions are usually correct. They surely were in the case of this franchise. Its first impression, created in Seattle in 1969, was that of a cash-strapped franchise having trouble competing on the major league level. Little has changed in the 41 years since the team moved to Milwaukee. Seattle was awarded one of the four expansion franchises given out by baseball for its centennial celebration in 1969. Former college and minor league players Dewey and Max Soriano were the recipients, backed by the money of William Daley, a former owner of the Cleveland Indians, who had once considered moving the Indians to the northwest. The Seattle Pilots lived only one year, finishing in last place in the American League West at 64-98. The team's escapades were immortalized far beyond their accomplishments in Jim Bouton's tell-all memoir "Ball Four." After the one season of poor play and lagging attendance (about 678,000) at the revamped minor league park called Sicks Stadium, Daley withdrew his investment, essentially bankrupting the team. The franchise was sold to a conglomerate headed by Milwaukee auto magnate Bud Selig. Despite some last minute legal contests, Selig won the approval of baseball to move the franchise to Milwaukee and the Brewers were reborn, having existed once previously in the American League's initial season of 1901. Those Brewers moved to St. Louis to become the Browns in 1902. The National League's Milwaukee Braves had played here from 1953-65. The Brewer's first decade was mostly a dance with the bottom of the American League - first the Western Division, where they played in 1970-71, and then the American League East, where they moved in 1972, trading places with the Washington Senators franchise which moved west to Texas. It did not matter in which division they played. The Brewers were basically a moribund crew through most of the 1970s. Their only claim to fame was having all-time home run king Hank Aaron on the team in 1975-76. Aaron hit the last 22 of his 755 home runs for the Brewers. The Brewers began to stir under the leadership of General Manager Harry Dalton and field manager George Bamberger, earning a third place finish in 1978. They steadily improved their roster until, at the end of the decade, they suddenly had one of the strongest teams in the game, featuring a combination of home grown talent and imported veteran talent including future Hall of Famers Paul Molitor and Robin Yount, plus Cecil Cooper, Gorman Thomas, Ben Oglivie, Sal Bando and Sixto Lezcano. The acquisition of all-star catcher Ted Simmons (1980) and relief ace Rollie Fingers (1982) helped put the team over the top. The Brewers won the back-half of the two-part strike season of 1981 with Cooper hitting .320 and Thomas smacking 21 home runs, one behind the league leader Eddie Murray. The team lost the divisional playoff to the Yankees in the maximum five games. There were great expectations for the 1982 team, but it got off to a sluggish start under manager Buck Rodgers. He was fired with the team at 23-24, and replaced by coach Harvey Kuenn. Under Kuenn, the Brewers went 72-43 and destroyed American League pitching to gain the nickname "Harvey's Wallbangers." The team clubbed 216 home runs, led by Thomas (league leading 39 homers with 112 RBI), Cooper (32 home runs, 121 RBI,.313 average) and MVP shortstop Robin Yount (29 homers, 114 RBI, .331 average). The team also featured solid pitching anchored by Cy Young Award winner Pete Vuckovich (18-6, 3.34 ERA), Mike Caldwell (17-13, 3.91), Moose Haas (11-8) and Fingers, who saved 29 games. The Brewers were tied with the Orioles for the East Division lead on the last day of the season. The Brew Crew prevailed in the final game, 10-2, to win its first, and through 2010, only outright divisional championship. They then became the first team to rally from a 0-2 deficit in the best-of-five league championship series, coming back to sweep three straight from the Angels. They came up short, however, losing a seven game World Series to the St. Louis Cardinals. Since their only postseason appearances in 1981-82, the franchise has had trouble competing. A combination of poor management, a famished farm system and restricted financial resources has kept the Brewers at or near the bottom of the standings. Two exceptions were a third place 91-71 record in 1987 with Tom Trebelhorn and a second place 90-72 record in 1992 with Phil Garner. In 2008, the Brewers earned their first postseason berth in the 26 years since their World Series appearance as the wildcard team in the National League. They were led by slugging first baseman Prince Fielder (34 homers, 102 RBI, .279 average), left-fielder Ryan Braun (37 home runs, 106 RBI,.285 average) and southpaw C.C Sabathia, who came over in a mid-season trade with Cleveland and went 11-2 with 1.65 ERA. The Brewers were eliminated in the divisional series by eventual World Series champion Philadelphia. On April 15, 1988 , the Milwaukee Brewers set a team record for largest attendance on an Opening Day game with 55,887 fans in attendance at County Stadium. 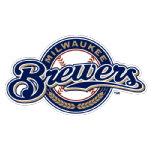 When the Milwaukee Brewers moved from the American League to the National League in 1997 they became the first team in Major League history to make such a crossover. Most Brewers' fans know that Robin Yount played the most seasons (1974-1993) for the franchise; however, did you know that the pitcher with the same record is Jim Slaton (1971-1977 & 1979-1983)?